Posted on March 19, 2013 by Lena K.
Morning Glory and Kase-san is an original manga by Takashima Hiromi. So far, it has 1 volume with 5 chapters and one special. Find the English translation at Yuri Project. 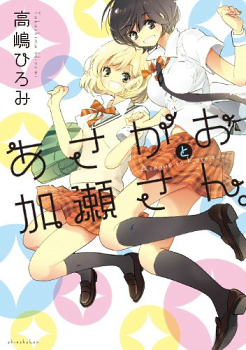 The story revolves around Yamada, a clumsy girl with not much self-esteem and only a few real friends, and Kase-san, a student from the class next door who is an excellent athlete, the star track team member, and on top of that, is popular all around school. Those two could not be more different from one another, yet once they meet, it is exactly the cool and a boyish aura of Kase-san that attracts Yamada’s interest. As already mentioned, the two main characters are very different from each other. Yamada, a plant appointee who’s taking care of the school garden flowers, is quite the shy and clumsy girl. Kase-san on the other hand, is an excellent athlete, has a lot of friends, and tends to look and act a little boyish. Despite the fact that those two are really different, it seems that when spending time together, they match each other quite well. The main focus is set on the relationship of Yamada and Kase-san. This is a very short manga so far, and I don’t even know whether the story will continue or the fifth chapter was the last one. But despite the fact that this was awfully short, the display of their growing feelings for each other was, at least in my opinion, done very well. Furthermore, this is a very light and simple story, and that’s probably why I can’t even find one negative aspect that would be worth mentioning. It is definitely not a very exciting read. It will more than likely relax you and leave you with a nice feeling. This entry was posted in Manga, Manga Review, Yuri and tagged Morning Glory and Kase-san by Lena K.. Bookmark the permalink. It was a cute and fluffy “discovering the love we secretly share for one another” story. I will wait till after the second volume before reviewing this one. So there really is going to be a second one? I read that this was ongoing but I haven't seen an update in a while and the end of volume 1 seemed like the perfect place to stop as well. I dunno. I assume there will be more. I wish some1 will translate it, cause I love this series cutenees. I read 9 chapters so far. I do not know just the couple is not very good for me. Well, yeah I can get that. Everyone has their own taste.